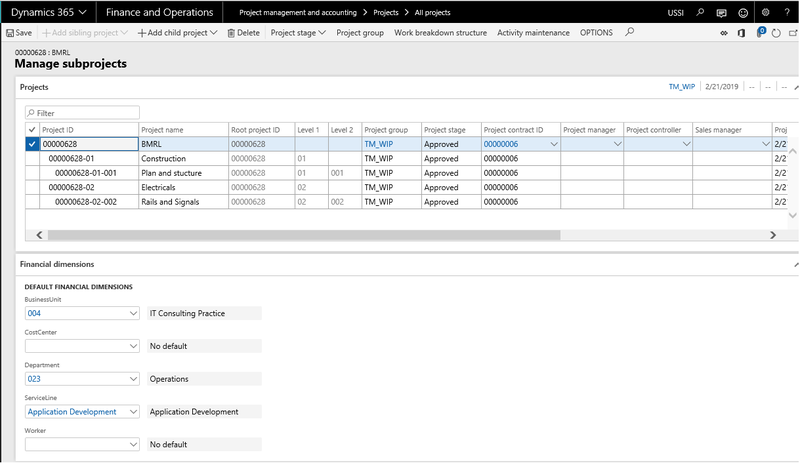 *This sections details out the how the subprojects can be created and managed using the Manage subprojects form. New form has been introduced in the Projects+ module for users to create and maintain subprojects from a single place. As and when users create the subprojects, values from the parent project is defaulted on to the child projects. All the defaulted values can be changed as desired by the users until the data is saved at least once. Once data is saved, only selected fields can be modified. Add child project When the user clicks this button a new dialog form is opened ‘Child project creation’ which allows the user to update the sub project format, Project name and create a new child project. This button gets enabled on the sub projects upto 2 level. Work breakdown structure Click to create and maintain work breakdown structure for each project. The form is divided into two section involving Project and Financial dimension details. Under the Project section, user can create new, delete, edit and filter sub projects. Users will be able to view the default values from the root project and can edit them if required. Project name Defaults from the parent project. However field is editable. Root project id Displays the project parent ID. Field is non-editable. Level 1 Displays the value defined while creating the sub project. Field is non-editable. Level 2 Displays the value defined while creating the sub project. Field is non-editable. Project group Defaults from the parent project. Field is non-editable. Stage Defaults from the parent project. Field is non-editable. Project contract ID Defaults from the parent project. However field is editable. Project manager Defaults from the parent project. However field is editable. 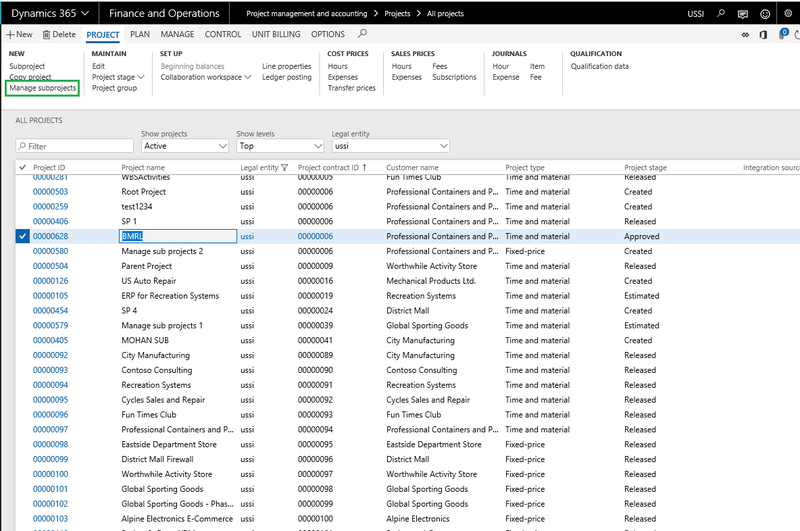 Project controller Defaults from the parent project. However field is editable. Sales manager Defaults from the parent project. However field is editable. Projected start date Defaults from the parent project. However field is editable. Projected end date User defined field. However field is editable. Actual start date Defaults from the parent project. However field is editable. Actual end date Defaults from the parent project. However field is editable. Under the Financial dimension section, If the Default dimension rules are configured then the same is respected on this form else financial dimensions from the parent project defaults on the sibling or child projects. New subprojects data entity called as ‘Manage subprojects’ with target entity named as ‘PMIPManageSubprojectEntity’ has been created to import and manage the larger subproject structures into the Manage subprojects form.